If you haven’t already read it, check out Nicole’s interview with the astute Helaine Olen. 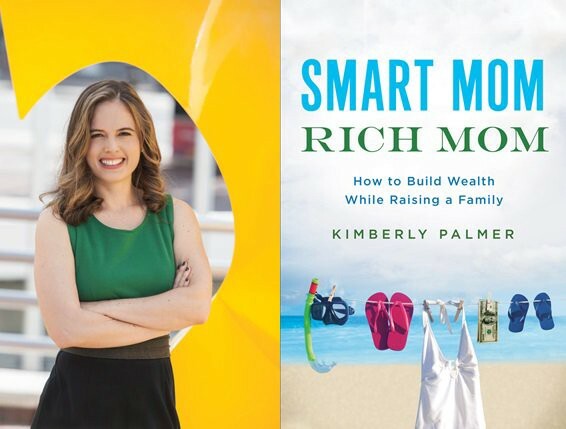 U.S. News personal finance columnist Kimberly Palmer has a more micro focus. She does not shame individuals for their money problems, but she does believe many of us, especially women, could make savvier choices. I found your book Smart Mom, Rich Mom really interesting, and so, for that matter, did my husband, who picked it up and began going through it. Ron Lieber, too! What was your reaction to his summary? Do you think he accurately summed up your message? Yes I definitely think it was fair, although I think some of the commenters misinterpreted it. He makes it clear that what I’m saying is that women should manage the household finances, together with their partners. It should be a shared responsibility. Some of the commenters seemed to think I was saying moms should be in charge with no input from their partners. One commenter did raise a good point, though: “Moms don’t do the money because they’re doing everything else.” Women / moms often get stuck doing the day-to-day things, the micro-managing, leaving men / dads to handle the more macro, abstract stuff like planning for retirement and handling finances in general. Yes, I definitely think it is a valid point that we are SO busy doing everything, how can we possibly add one more thing to our plate. BUT I think we have to find a way to make managing money — including those big picture things like saving for college & saving for retirement — a priority, as important as taking our kids to the pediatrician in some ways, because it truly determines the security of our families. Some actions, like setting up an estate plan and will, are time consuming but are essential to making sure your children will have financial security in their lives. So I think we don’t have a choice but to take on the responsibility of managing money, along with everything else we’re doing. One thing we can do less of is couponing or looking for discounts. There’s nothing wrong with it, but using that hour instead to review your savings/retirement accounts will be better for your family in the long run. I was struck by how little you suggested getting the partners to do. To my mind, you can’t pour more water into an already full cup; and if most moms already feel full to overflowing, they may need to take more than savvy shopping out of their cup in order to add anything substantial in. Why not ask partners to do more? Why can’t they take the kids to the pediatrician or take on other family responsibilities that traditionally fall to women? Your focus seemed to be much more about what you, the mom, can do differently. Do you think it’s still easier to chide / inspire women to change than to try to get men to? This is very interesting … about partners … no one has asked me about this yet! I will tell you the reason I did not focus on outsourcing to partners: In many families, perhaps 30% if I remember correctly, there is no partner. Single moms are running the whole show so there is no one to outsource to. And if there is a partner now, there is a non insignificant chance he will not be around in the future: death, divorce, etc. In fact, there is a very high chance — 90%, according to Fidelity — that women/moms will be solely in charge of their money at some point in their lives. So yes, it is a lot for moms to handle, but we don’t really have a choice. We are the ones are kids are counting on! That is how I think about it. It’s basically on our shoulders, as so much is. I didn’t feel chided, more inspired. But I do think it’s common in our society to assume that women need to be scolded into having smarter habits, or being more responsible, and I’ve wondered whether it’s because women are more accepting of advice (having been conditioned to be?) or whether it’s a leftover from the days when women were assumed to be on par with children, in terms of their capacities. Few people give advice to “men” — you know? Whereas messaging to “women” seems to be everywhere, and much of it is contradictory: hate yourself, indulge yourself, buy this, don’t buy that, be frivolous and fun, why aren’t you smarter about money. It can get a bit exhausting. I don’t think men have the same history of advice books as we do 🙂 You are right, we are always being told what to do! I need to do some more self reflection on this question! A lot of Billfold readers are not moms yet. Some of them never intend to be. What are your key takeaways for those women, both those who are perhaps preparing to have kids someday and those who want to remain child-free but still financially savvy? There are lots of takeaways for the women who are not moms but may become moms one day! That is because actually our whole financial path begins LONG before we have kids, back in our early 20s or even earlier. The choices we make then, even regarding which college major we choose, have a huge impact on our financial situation later. In fact, one of the most disturbing findings I came across that I talk about in the book is that in their 20s, young women are already earning less, saving less and investing less than young men (according to a Wells Fargo survey). Of course 10 years later, when they are moms, there is still a gender imbalance. We have to break this cycle! So that starts in your 20s: getting into strong habits with saving, investing for your future, even earning more by negotiating your salary/chasing higher paying jobs — those are big things to do in your 20s to prepare for your future, whatever life choices you make. And on that note, for some women, especially those in training heavy fields, it can make financial sense to start your family in your 20s, when you are still in school, so that by the time you get farther in your career with more responsibilities, your kids are a bit more self-sufficient. Lastly, as you get really close to actually thinking about having kids, the best thing you can do is saving money so you can fund either a period of earning less during a maternity leave or child care—because however you handle it, it is expensive! Will you join me in my crusade to get everyone to stop thinking that the money for child care comes out of a woman’s salary, if there is a partner in the house? Childcare enables parents to work, and so it should be seen as a joint responsibility; the onus shouldn’t fall on the mom, or else it puts both an unfair psychic and real burden on her, the partner who usually earns less already, to earn more than childcare costs or leave the workforce. What did your parents teach you about money that resonated most or has stuck with you? The single best thing my parents did, my mom, specifically, was write me a letter when I was about 21 (the letter was also to my younger sisters) about her money choices — good ones and also mistakes. It was a pretty long letter, like two pages, of her money advice. And it opened my eyes to thinking it was important. Shortly after she sent that letter, when I was still in grad school, I opened by first Roth IRA, funded by my freelancing money at the time. I think writing your kids a letter about money can be so powerful, I included a template in the back of the book. The other thing they did, when I was in my teens, was to really incentive me to start saving by offering to match certain amounts. I don’t remember exactly but it was something like, they will match 100% of the first $50 we save (we being me and my sisters), 50% of the next $50, and perhaps a 25% on savings above that amount. So it got us in the habit of saving money really early. Also, my Dad is from England and growing up in post-WW2 England, he had a very frugal upbringing — no food was allowed to be wasted. Even the bath water was measured so they didn’t use too much. And he definitely passed on that frugal attitude to us by sharing those stories. And giving us a sense of appreciating what we do have. I appreciated how you included in the book stories of women who didn’t have great role models, or who didn’t clue into how important it would be to feel confident around money until mid-life and then had to shift into gear. How would you advise people who have not, until now, felt terribly confident dealing with, let alone investing, money? I think one of the most powerful things we can do is talk to older women who have been in situations similar to ours and learn from them how they got through it, what choices they made, what was helpful and not helpful … talking to older women also helps us imagine our future selves and future lives and the possible unexpected things that might happen. This is one reason I LOVE reading women’s memoirs: they often have a not-so-subtle financial element to them. For example, Alexandra Fuller’s Leaving Before the Rains Come tells the story of her divorce, and in it, she also talks about how she had to learn how to manage money, because previously she had let her husband handle all of it. Reading memoirs like that opens your eyes to what can happen and how to be prepared for the unexpected. It also shows us that we can do a good job embracing the money management side of things! So it inspires confidence, too. I’ve pulled out some of my favorite quotes from your book. Can you elaborate a bit on them? This is a very interesting finding from the research of Senator Elizabeth Warren, done long before she became a senator. It just shows how big of an impact kids have on our financial lives: they put enormous amounts of stress on it, making it harder to keep a job in some cases as well as adding enormous expense. That last one, insurance policies, so often gets overlooked, even by moms who are otherwise on time of their finances. It’s just hard to take the time to figuring out life insurance: how much to get, how to get it. But it’s such an important step, to protect your family from the most terrible thing that could happen. “Credit unions tend to offer slightly higher interest rates on savings.” You also suggested readers check out MaxMyInterest.com. It’s important to spend some time picking the best financial institution for you, whether it’s a credit union or bank. You have to consider whether you have a lot of savings in the bank, in which case you’ll want to seek out the best interest rate, whether you need lots of nearby ATMs, and whether you can avoid fees. It is a disturbing state of affairs. Many of us should be saving much more than we are if we ever plan to retire. Research suggests women tend to be more conservative as investors. That can be a very good thing that protect your money in downturns, but it can also mean that the money isn’t invested as aggressively to take advantage of the upside. There really is no reason to waste energy considering mistakes you’ve made in the past. You have to just get started moving in a new direction today. This is one of those life lessons best heard from the older women in our lives — you really can’t know what to expect from life, and older women who have been through it all can shed light on that for us. As a money writer, I am pretty disturbed by much of the media released in our direction that treats us as if we are merely pinching pennies while our husbands take care of investments — that is so far from the truth. Richness is definitely about so much more than money! It’s about having what we want in life, and more money in our bank accounts can make it easier to do that.